The Advantage Checking account offers all the convenience of our regular checking account, plus the added peace of mind of courtesy pay and identity theft resolution service. There is a monthly membership fee of $6, which is taken out on the first of the month. What Makes Advantage Checking Different? In addition to all of the free perks that our Regular Checking has, our Advantage Checking has a few more added benefits. CyberScout identity theft protection and resolution service. Click here for complete details. $500 Courtesy Pay. Courtesy Pay will save you the embarrassment and expense of returned checks when you make an honest mistake in your checkbook, have unplanned expenses, or run short on cash between paydays. Instead of returning checks unpaid, we may automatically pay them for you, up to $500. Free personally imprinted credit union custom checks. To get started with opening your checking account, check out the options below to see which one best fits your needs. 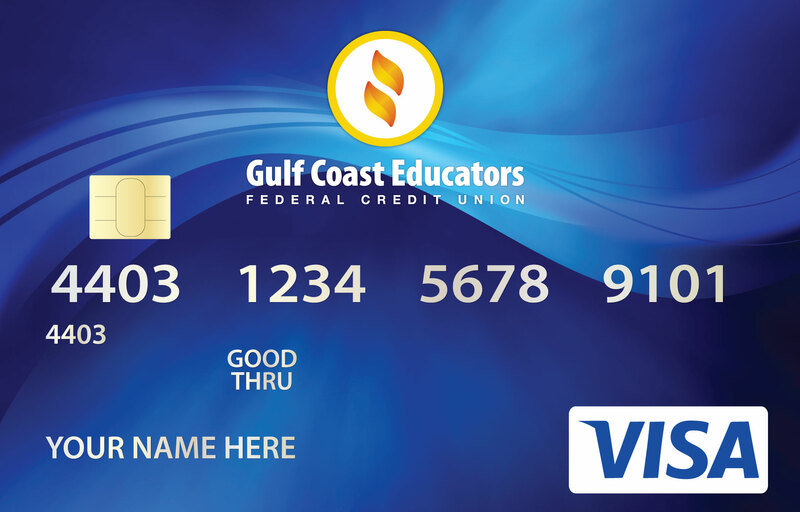 If you are already an established member at Gulf Coast Educators FCU, you can easily open your new checking account online. Simply click the Get Started button and fill out the form. After you have submitted the form, one of our online account representatives will get your account opened. If you are not already a GCEFCU member, you will first need to open up a savings account to establish your membership. 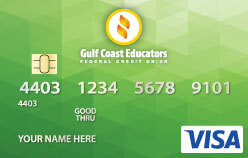 You can learn about all of the perks of membership at Gulf Coast Educators,our membership qualifications, and open your account online by clicking the Learn More button. 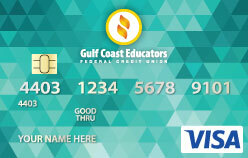 At Gulf Coast Educators, we give you many options when it comes to picking out your debit card. You can choose from one of our four standard designs below, or your can opt to create your own card through our My Card Create website. There is never a charge to use Gulf Coast Educators ATMs, but some other financial institutions impose fees called “surcharges” when you use their ATMs. Not nice. To avoid these fees, we’ve partnered with the Allpoint Nationwide Network. Look for one of the more than 55,000 Worldwide Allpoint ATMs for a “No Surcharge” ATM near you. You’ll find Allpoint ATMs in retail locations such as Walgreens, CVS, Target and more. Last month alone, our members saved over $30,000 in surcharges by using Allpoint ATMs. That’s money that our members got to keep. Find an Allpoint “No-Surcharge” ATM near you. Using the Allpoint search feature will redirect you to the Allpoint website. 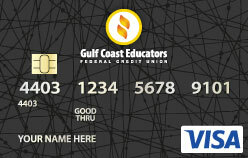 Gulf Coast Educators Federal Credit Union is not responsible for the content of the alternate website. Shared branches allow our members to conduct certain types of transactions at participating credit union locations throughout the US. With over 5,000 locations, you’re never far from your credit union accounts. There are limits to the types of transactions you can do at a shared branch, so please call ahead to confirm. Search will open in a new window on the CO-OP shared branching site. You can transfer money to your accounts at other credit unions or banks by adding them as an external account. Simply log into online banking from your desktop computer and go to the SETTINGS section. Select the ACCOUNTS tab and click LINK AN EXTERNAL ACCOUNT. Once you have completed all of the steps, you can make transfers to and from your external account within the TRANSFERS section of online banking. If you have any questions, please feel free to call or text us at 281-487-9333. For your peace of mind and to protect your account against possible overdrafts (and to enable you to take advantage of any financial opportunities which may arise) GCEFCU offers overdraft protection. Once you sign up for this service, available funds in your share (savings) account will automatically be transferred to your share draft (checking) account if it should become overdrawn.